“I am proud that the Senate voted overwhelmingly to pass the National Defense Authorization Act and I’m deeply humbled that my colleagues saw fit to do me the undeserved honor of designating it in my name,” said Chairman McCain. “This legislation continues our reform agenda and helps better position the Department of Defense and the joint force to implement the National Defense Strategy by continuing to restore readiness, rebuild capacity, and modernize capabilities. “I am grateful to Senator Jim Inhofe for shepherding this important legislation in my absence and to Senator Jack Reed for the spirit of partnership he always brings to this endeavor. Their bipartisan collaboration represents the best of the Congress and has become a hallmark of the NDAA. “While I wish the Senate had been able to come to an agreement to debate and vote on more amendments, I am glad the legislation proceeded under regular order and that Senators Inhofe and Reed were able to work with leadership to incorporate 45 amendments from colleagues on both sides of the aisle. And I’m proud that the Senate Armed Services Committee did its work by considering and adopting over 300 bipartisan amendments during the committee markup. “I am particularly proud that the NDAA once again strengthens and enhances Arizona’s outsized role in securing and defending the nation. It is my great honor and privilege to represent the people of Arizona, especially the brave men and women who answer our nation’s call to serve. This legislation would give Arizona’s service members the support, training, and equipment they need to defend our freedom at home and abroad,” added Chairman McCain. “The Mesa Industry and Defense Council would like to thank Chairman McCain for his incredible leadership on the FY19 National Defense Authorization Act. This legislation will allow for the East Valley and all of Arizona to remain an asset for our nation’s military. His continued leadership will positively impact our industries for many years to come,” said Sally Harrison, president of the Mesa Industry and Defense Council. 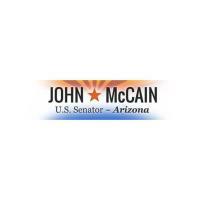 “The Southern Arizona Defense Alliance would like to thank Senator McCain for his commitment to southern Arizona’s defense installations. This year’s defense bill, named in honor of the senator, ensures that Arizona will once again lead the way in preparing our nation’s military,” said Amber Smith, president of the Southern Arizona Defense Alliance. “The Yuma 50 is extremely grateful for the leadership of Chairman McCain and for his efforts on behalf of Yuma’s defense installations. Modernizing our critical ranges and test assets will best protect the warfighters who keep all of us from harm. Our Marine Air Corps Station and the Army’s Yuma Proving Grounds will greatly benefit from this year’s defense bill,” said Julie Engel, president of Yuma 50. The NDAA would authorize $184 million to keep our A-10s airborne, many of which are stationed at Davis-Monthan Air Force Base in Tucson, Arizona. Specifically, the bill would authorize $144.2 million to fund the A-10 Wing Replacement Program, which is $65 million more than the administration’s request. This would ensure the A-10 continues to support coalition forces in the fight against the Islamic State of Iraq and the Levant (ISIL) and aid NATO’s efforts in Eastern Europe to deter Russian aggression. Finally, the NDAA would authorize the flight hours, pilot training, fuel, maintenance and ammunition for all A-10s in the upcoming year. The NDAA would fully fund the EC-130H Compass Call electronic attack and electronic early warning airplanes stationed at Davis-Monthan Air Force Base in Tucson, Arizona. These jamming and surveillance planes are critical to disrupt enemy command and control systems. They also protect our ground troops from sophisticated electronic attacks in conflicts across the Middle East, as well as against potential threats in the Pacific and Europe. The NDAA would direct the DOD to review efforts underway to cooperate with Department of Homeland Security fusion centers and cybersecurity assets across the states to combat threats in cyberspace. Specifically, the review would determine levels of collaboration among federal agencies, the National Guard, and the public and private sectors in the area of cybersecurity. Arizona’s success in cyber collaboration among numerous stakeholders could serve as a scalable model for cybersecurity efforts throughout the rest of the nation. The NDAA would require the DOD to review the workforce and infrastructure requirements for testing of the next generation of combat and support capabilities over the next five years. This provision would specifically require an investigation into workforce and infrastructure needs at Major Range Test and Facility Bases, such as Yuma Proving Ground, to support testing of priority emerging technologies – advanced computing, “big data” analytics, artificial intelligence, autonomy, robotics, directed energy, hypersonics and biotechnology – that have the potential to change the nature of warfare. This will ensure that our people and test equipment can support the rapid evolution of tomorrow’s combat and support systems. The NDAA would fund 75 F-35 fighter jets for the Air Force, Navy, and Marine Corps. This would ensure Arizona has the highest concentration of 5th generation fighters in the world. Luke Air Force Base and Marine Corps Air Station Yuma will continue to provide unparalleled training and access to the Barry Goldwater Range complex, and prepare aircrew to fight and win any future high-end conflicts. The NDAA would also provide for an additional $100 million for F-35 spares and repair parts, ensuring the continuity of logistics operations and maximizing aircraft availability. In light of the increasing occurrence of aviation mishaps and the 2018 National Defense Strategy, the NDAA would require the services to comprehensively review the state of military aviation readiness, including pilot retention and training, flight hours, force structure, squadron manning, maintenance training, aircraft readiness and logistics processing. This holistic review would examine shortfalls and make corrective recommendations for the military aviation enterprise to ensure our aircraft, aircrew, and maintenance personnel are ready to fight and win in a conflict with a near-peer adversary. With Air Force, Army, and Marine Corps aircraft stationed in Arizona, this provision would help ensure our highly skilled pilots are ready for any fight. Fully funds 24 F/A-18E/F Super Hornets, and authorizes multiyear contract authority for up to 72 F/A-18 Super Hornets, needed for carrier-based power projection and maintaining global security. This would ensure Arizona’s defense industry continues to manufacture new weapons systems and defense technologies our warfighters need to defend and protect our nation from advanced threats. Includes funding for larger weapons systems, including the F-35 aircraft. This would directly employ 31 different suppliers in the East Valley, providing both services and manufacturing products throughout Arizona. Funds significant investments in Ballistic Missile Defense research and development that would support Arizona businesses in both traditional intercept methods and directed energy technology. Fully funds the Army’s request of $1.04 billion for a total of 60 Apache helicopters. This would provide Mesa with stability and predictability for Apache manufacturing and ensure our ground forces are supported by this critical airborne capability. Funds Arizona’s next-generation products that enable automation, reduce maintenance and reduce overall costs for Ford Class Aircraft Carriers. Funds the manufacturing of 450 Sidewinders, 360 AMRAAMs, 784 Javelins, 240 Patriot MSEs, and 45 ESSMs to be manufactured at Raytheon in Tucson, totaling $2.498 billion. This total would include Senate authorization of 69 Tomahawks in addition to the president’s request. Funds the Navy’s request for 125 Standard Missiles, and authorizes multiyear contract authority for up to 625 SM-6 Standard Missiles, to be developed at Raytheon in Tucson, totaling $490.2 million. Funds $80 million for the Missile Defense Agency’s programs for Boost Phase Technology to continue research and development of three separate laser scaling efforts with the goal of demonstrating a 500 kilowatt laser by 2022 and a best of breed 1 Megawatt laser capability by 2024. Directed Energy is a key technology that will enable development of a boost phase intercept capability, and support large and small local business contractors. Authorizes land conveyance of approximately 58 acres on Air Force Plant 44, located adjacent to Tucson International Airport, to the Tucson Airport Authority (TAA). This land conveyance will facilitate a TAA planned project to relocate and extend a parallel runway and make other airfield safety enhancements at the Tucson International Airport, helping the local area continue to support vital National Guard missions. Luke Air Force Base, Phoenix: $23 million for F-35A Aircraft Maintenance Unit Facility and $17 million for F-35A Squadron Operations building. Davis-Monthan Air Force Base, Tucson: $15 million for Aerospace Ground Equipment Facility. Arizona Army National Guard Camp Navajo, Flagstaff: $14.8 million for Missile Motor Magazine and utilities and site improvements. The NDAA would authorize a 2.6% pay raise for service members. It would also support military families by authorizing $40 million in supplemental impact aid to local educational agencies with military dependent children and $10 million in impact aid for schools with military dependent children with severe disabilities. In order to better serve our military spouses, the bill would authorize the head of a federal agency to appoint, non-competitively, either a spouse of a member of the Armed Forces on Active Duty or a spouse of a disabled or deceased member of the Armed Forces. It would also require the service secretaries to establish and maintain multidisciplinary teams on child abuse and other domestic violence at military installations. In addition, the bill would modernize the 38 year old officer personnel system to provide career flexibility and better serve the demands of today’s force. The bill would also require the Director of the Defense Health Agency to implement a comprehensive pilot program to minimize early opioid exposure in beneficiaries under the TRICARE program and to prevent misuse or abuse of opioid medications. The NDAA would provide for an increase of $20.6 million in technology to enhance drug detection and interdiction capabilities in Central and South America, through U.S. Southern Command. Additionally, the bill would express support for U.S.-Mexican military-to-military cooperation on national security challenges such as border security – combating transnational criminal organizations, countering narcotics, human trafficking and unauthorized migration. These provisions would promote cooperation with our neighbors and partners in the Western Hemisphere and protect the safety and security of Arizonans. The legislation now moves to conference negotiations with the House of Representatives. The full summary of the bill can be found here.